Boasting of breaking 7 world records, this 2 minute ride takes place in a wing coaster which leaves your feet dangling in the air. The ride starts with a 170 foot lift hill at a 40 degree angle. Once riders crest the top of the hill, the train rotates 180 degrees to the right and falls down a 164 ft “Wing Over Drop” reaching speeds of 67 mph. 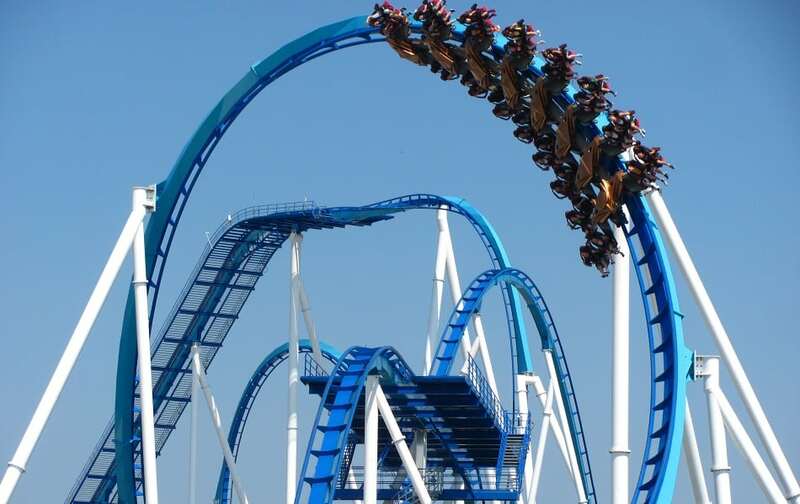 The coaster then rolls through an adjacent immelmann turn, and coasts over a 105′ camelback hill, followed by a “Giant Flat Spin” and through a Zero-G Roll—which includes two key-hole towers. At the bottom of the zero g roll, the train coasts through an inclined diving loop, then through an inline roll and continues through a mid-course brake-run, a camelback drop, a 360° helix, a small bunny-hop and then into the main brakes. Phew.